Drunken Gunmen - "Journey To The Far Side Of The Sun"
From Australia, Drunken Gunmen, though sounding like a band, is apparently a solo project from Spaced Out Sounds label head Graeme Kirk. 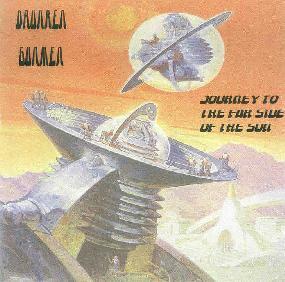 The CD only has 4 songs, 2 of them very good and 2 just ok. "Journey To The Far Side Of The Sun" is a totally cosmic stoner space rocker with swirling UFO space guitars and a heavy driving fuzz guitar. "Fractal Parsecs" features pulsating Ozrics styled synth patterns, freaky vocals, and wailing psych guitar. Both excellent tunes! The other tracks include "The Thousand Lightyear Stare", a droning valium paced psychedelic number with a gothic flavor. And "Shiva's Descent" is a decent but less than exciting stoner psych tune. Still, on the strength of the two hot tracks I'd recommend checking these drunkards out and let's hope for a full-length soon. For more information you can visit the Spaced Out Sounds web site at: http://www.spacedoutsounds.com/. Contact via snail mail c/o Spaced Out Sounds; PO Box 165; Jannali NSW; 2226; Australia.